Claims and counterclaims are the order of the day between Turkey and Russia. The US and Syria stand not side-by-side, but rather on each side, most of the time, but not all of the time. Background for this post is the deliberate shooting down by Turkey, a Russian aircraft attacking ISIS and alleged moderate rebels in Syria. At most, Russian aircraft were over Turkey for a matter of seconds. But Russia claims its aircraft were not over Turkey at all. Then came the unbelievable lie Turkey Says It Had Not Recognized the Aircraft as Russian When it Shot it Down. Putin angrily dismissed Turkey's claim as “impossible” and said Russia had provided the US with information on the time and location of its sorties. Russia claims Turkey shot down plane to protect oil trade with ISIS. Turkish president Recep Tayyip Erdogan responded He Will Resign if Putin Can Prove the Claim. Next, Erdogan Challenged Putin to Resign if he Can't Prove Turkey Buys Oil from ISIS. Meanwhile, RT claims Russia has ‘More Proof’ ISIS Oil Routed Through Turkey. The article did not adequately detail the alleged proof. 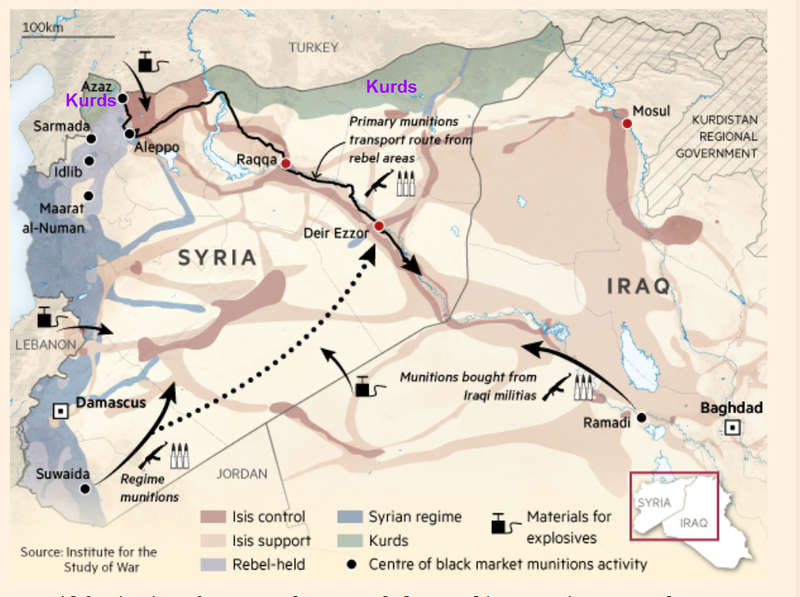 Without a doubt, ISIS oil is flowing through Turkey. But there's a huge semantics question in play. 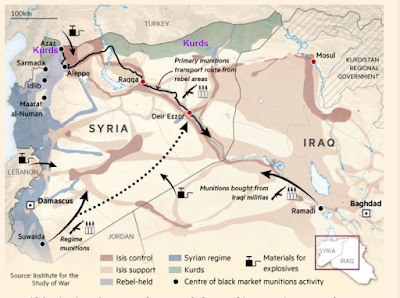 Does proof require the Turkish administration bought ISIS oil? Or is it sufficient that some smugglers in Turkey do just that? In Turkey was protecting ISIL oil Smuggling; Russia urges Assad-Kurdish Alliance, Yuan Cole at Informed Comment offers an option that I largely agree with, but he did miss one significant aspect. Putin has a much more effective way of bringing the pain to Erdogan. The PYD and its paramilitary arm, the YPG (People’s Protection Unites) are considered by Turkey to be branches of the separatist Kurdish terrorist organization the PKK (Kurdistan Workers Party), but the US and Russia do not agree, and have been willing to cooperate with the leftist Kurds in Syria against Daesh (ISIS, ISIL). Nothing would anger Turkey’s government more than for Russia to give military support to the Syrian Kurds in their quest to establish a connected territory, “Rojava,” linking the three major Kurdish cantons in northern Syria. “When we look at the political sphere, Moscow is going to try to render Turkey as ineffective as possible in the Syrian negotiations. It is useful to recall that the United States and Russia are spearheading the negotiations in question. And it is also useful to keep in mind that Turkey, because of a series of strategic mistakes, is one of the weakest links of the Syrian table. Now if you were [Syrian President Bashar] Al-Asad, would you not be rejoicing on account of Turkey’s having shot down the Russian plane?" The primary beneficiary of this mess is neither the US nor Turkey. Here they are. The biggest loser is Turkey, arguably followed by the US for its inane backing of alleged moderate Al Qaeda rebels. Of course, the US goal of overthrowing Al-Asad without having any reasonable replacement is so ridiculous, the US is in reality an inadvertent winner. Sealing the border between Turkey and Syria and also between Turkey and Greece is exactly what I have been calling for. Turkey may be unlikely to cooperate because it would rather deal with ISIS than the despised Kurds who may seek their own territory in Turkey. There is one more winner that needs to be addressed: US warmongers. In response to the shootdown of the Russian aircraft by Turkey, Russia Arms Fighter-Bombers in Syria with Air-to-Air Missiles. Russia announced Monday that a class of its fighter-bombers in Syria has been armed for the first time with air-to-air missiles for "defensive purposes" in a move that posed a potential risk to U.S. and coalition warplanes flying missions against the Islamic State. The provocative action followed warnings from Russian President Vladimir Putin that Turkey would pay a price for shooting down last week a Russian Su-24 Fencer frontline bomber in which a Russian pilot was killed and a Russian marine died in a rescue attempt near the Turkish-Syrian border. The U.S. has six air superiority F-16C fighters at the Incirlik airbase in Turkey that could counter the Russians, but those aircraft have seen limited duty, Pentagon officials said. The F-16Cs were originally sent to Incirlik in October with the intention of helping the Turks guard their airspace, but the F-16s "have not to date flown any CAPs (Combat Air Patrols)," said Navy Capt. Jeff Davis, a Pentagon spokesman. The Mideast tension between a multitude of players increases the likelihood of an "accident" or an "accidentally on purpose" type of incident between Russian and Turkey or Russia and the US. Warmongers would cheer such events. Finally, I offer an opinion that Turkey did not shoot down the Russian jet over oil per se, but rather because Turkey would rather deal with ISIS than the Kurds. Chancellor Merkel is downright idiotic to be supporting Turkey in this set of circumstances, but here we are. In this aspect, Turkey is a big winner and the EU a big loser if Turkey gets the German/EU concessions it seeks.